Emperor Seimu (成務天皇, Seimu-tennō) was the 13th emperor of Japan, according to the traditional order of succession. He also known as Wakatarashihiko no Sumeramikoto. His reign is conventionally dated as AD 131–191. He is credited with appointing the first provincial governors and district officials. Seimu is regarded by historians as a legendary emperor who might have been real. Little is known about him. The reign of Emperor Kinmei (c. 509 – 571), the 29th emperor, is the first for which contemporary historiography is able to assign verifiable dates; however, the conventionally accepted names and dates of the early emperors were not to be confirmed as "traditional" until the reign of Emperor Kanmu (737–806), the 50th sovereign of the Yamato dynasty. The name Seimu Tennō was assigned to him posthumously by later generations. 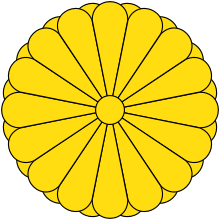 If Seimu did exist, there is no evidence to suggest that the title tennō was used during the time period to which his reign has been assigned. It is much more likely that he was a chieftain, or local clan leader, and the polity he ruled would have only encompassed a small portion of modern-day Japan. His father was Emperor Keikō and his mother was Yasaka no Iri Bime no Mikoto, a granddaughter of Emperor Sujin and a first cousin of his father. The actual site of Seimu's grave is not known. This emperor is traditionally venerated at a memorial Shinto shrine (misasagi) at Nara. The Imperial Household Agency designates this location as Seimu's mausoleum. It is formally named Saki no Tatanami no misasagi. Seimu's tomb can be visited today at Misasagi-cho, Nara City. 1 2 Imperial Household Agency (Kunaichō): 成務天皇 (13); retrieved 2013-8-28. ↑ Titsingh, Isaac. (1834). Annales des empereurs du japon, pp. 14–15, p. 14, at Google Books; Brown, Delmer M. (1979). Gukanshō, p. 254; Varley, H. Paul. (1980). Jinnō Shōtōki, pp. 99–100. ↑ Kelly, Charles F. "Kofun Culture", Japanese Archaeology. 27 April 2009. ↑ Aston, William George. (1998). Nihongi, Vol. 1, pp. 214–216. ↑ Ponsonby-Fane, Richard. (1953). Studies in Shinto and Shrines, p. 419.